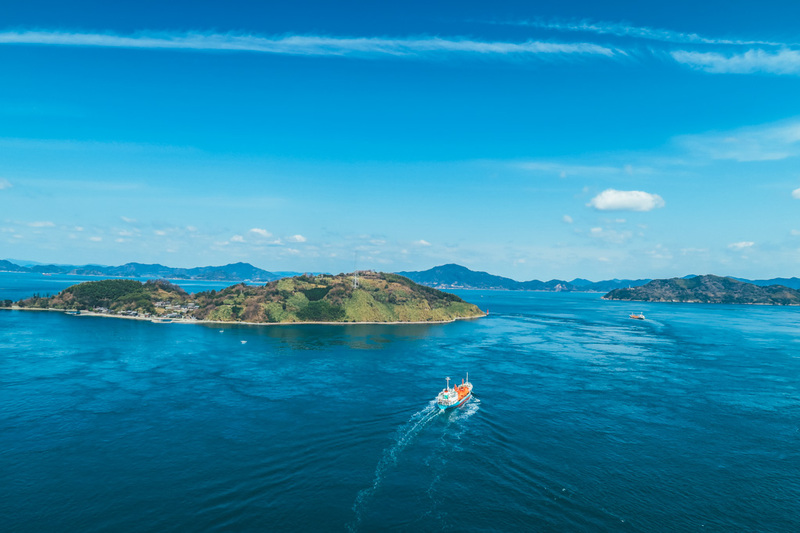 When I thought of Japan, before ever getting here on my first ever visit, the last thing that came to mind was vibrant blue water, beautiful beaches, big bridges and islands. It’s funny how we can mentally sum up a foreign place by the photos we’ve seen of just one city (for me that’s always been Tokyo) and in the process forget there is so much more to explore. During my tour of the country thanks to the Japanese Tourism board I’ve had the pleasure of experiencing areas of Japan that I never knew existed. One of those areas has been the Shimanami Quad Quid Expressway, which I toured via bike. 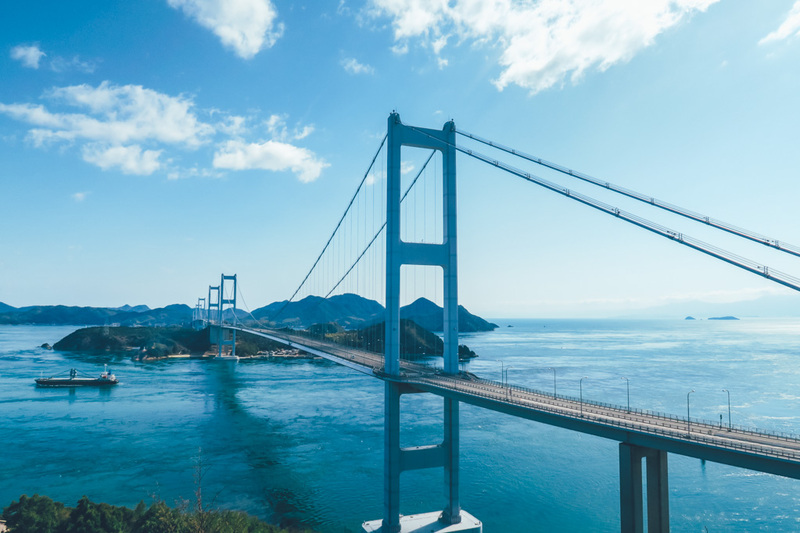 The Expressway, which is also known as the Nishi-seto Expressway is a 60km long highway designed for both vehicles and bike riders and links the islands of Seto Inland Sea with nine large towering bridges that run between Onomichi in the Hiroshima prefecture and Imabari in Ehime. 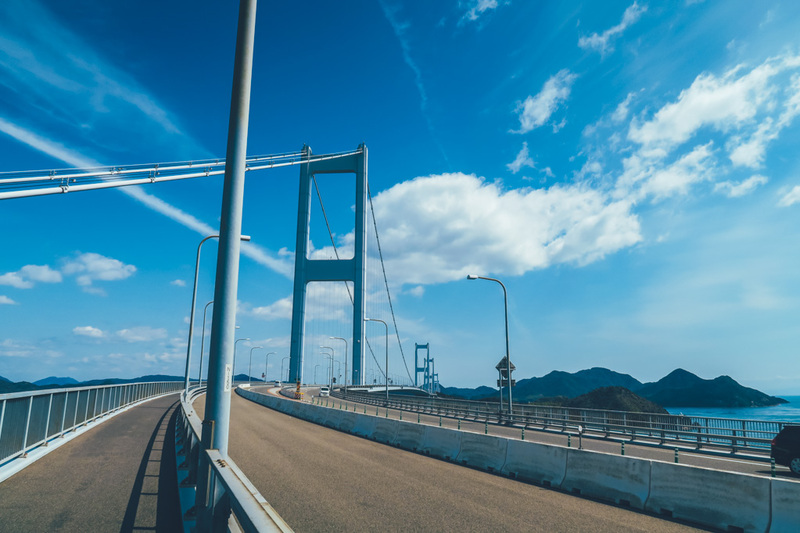 It’s an incredibly grand highway, which is unique in it’s ability to offer idyllic scenery, fresh air, nature, beautiful views all while providing some moderate exercise for those riding, walking or jogging the path. 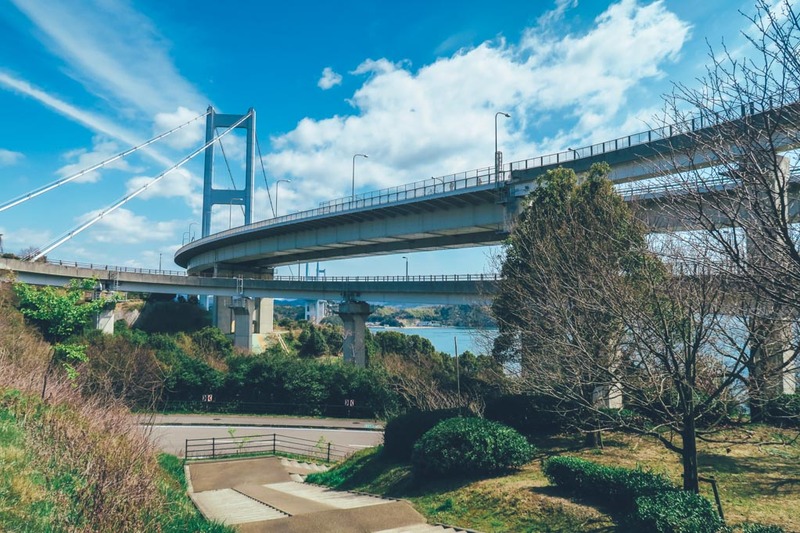 The Expressway bridges allow for both cars and walking/bike areas, which provides for safe and easy access for tourists and locals to use the bridges as they see fit. 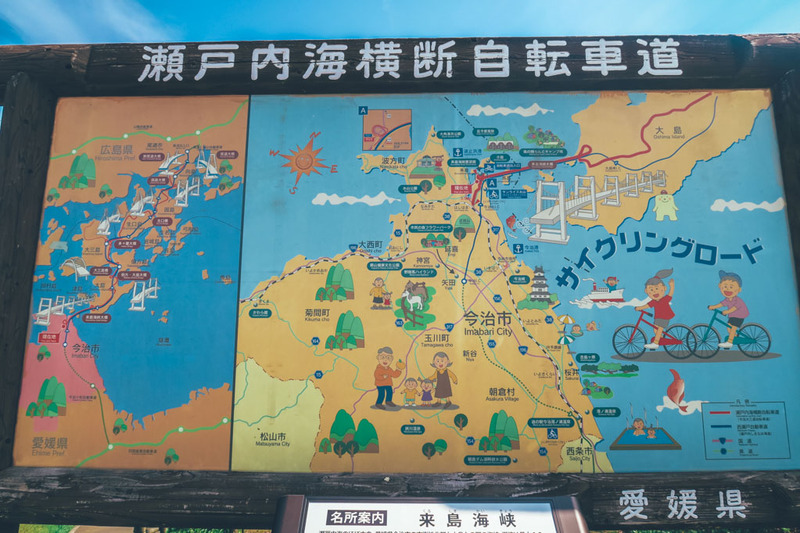 The bike path is roomy and vast which is great as it makes for pleasant riding in groups and allows you to feel very free and liberated while exploring this unique area of Japan from such great heights. Hiring a bike is easy and to my delight there are both standard bikes and electrical bikes, and yes I took the electrical one and I suggest you do too if you’re not a pro rider like myself. 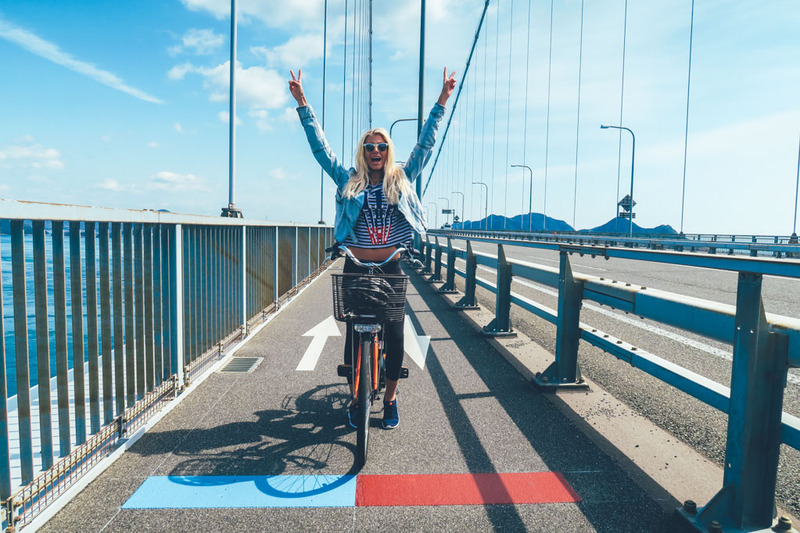 The ride across each bridge is surprisingly flat which makes the ride fairly doable for anyone of any fitness level and if you’re worried about your energy levels, then go with the electrical bike option or even a tandem bike with who ever you may be traveling with. 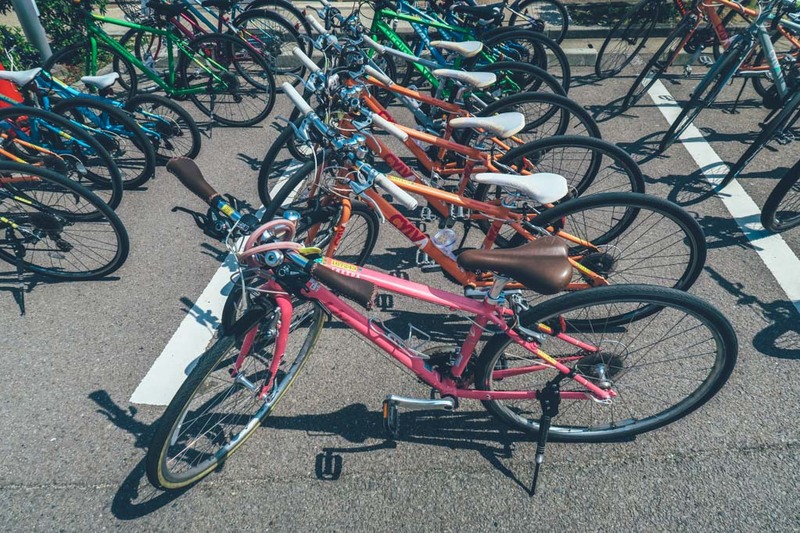 If the idea of riding 60km has you concerned, don’t fret because all non electrical bikes can be returned at any of the 14 bike shop locations along the route, which allows you to pick and choose how far and hard you want to push yourself. One tip I have is be sure to go to the near by looks out if you’re starting at the first bridge as it gives a great overview of the journey ahead of you. I stopped there and got some great images of the road ahead and the lookout allows you to capture the bridges in their size from a distance while still capturing the landscape and sea around them for context. While you’re on the bike route, it’s not only a keen bike riders dream but also a travellers dream, as it’s impossible to get lost. 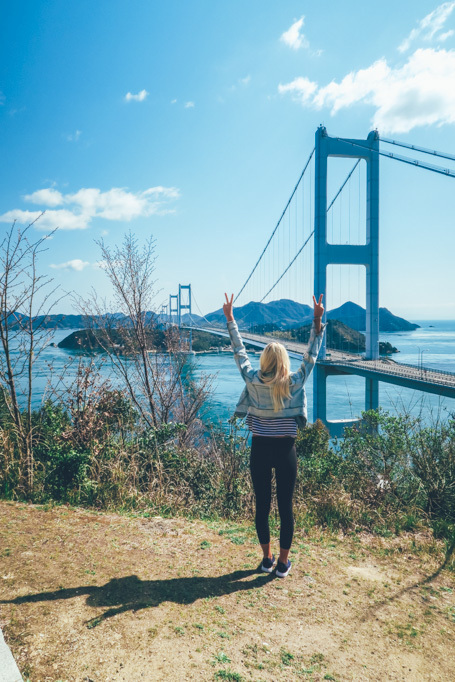 Each bridge entrance and exit is clearly marked and the signage of the area can be seen in Japanese with easy to understand images and also some english signs along the way. The path really is a cyclist heaven and it’s not only well loved by travellers that decided to take the route, but by many more serious cycling locals who are sure to pass you at impressive speeds along the way! 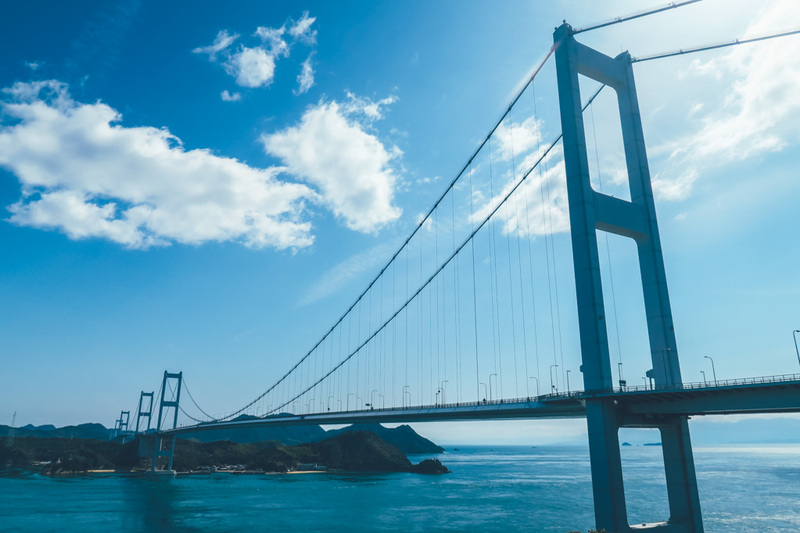 Bridge Toll- Each bridge has a ¥50 – ¥100 coin basket along the way as a small toll for each bridge used. 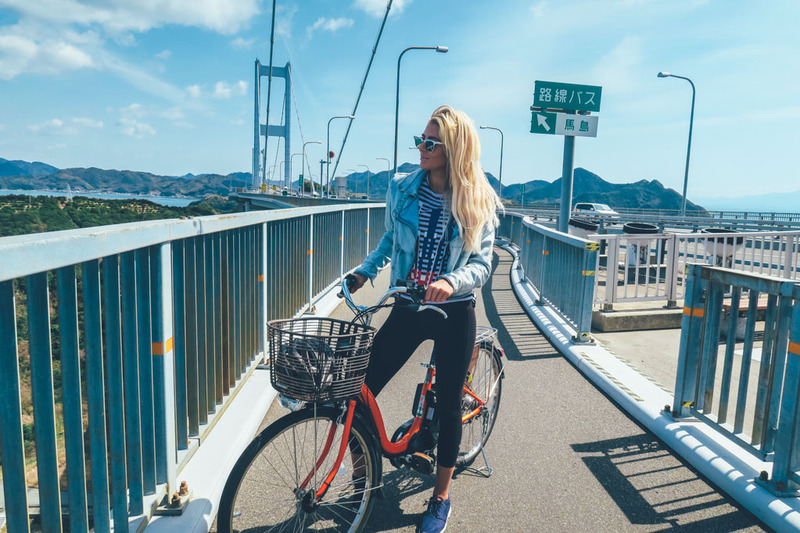 Bike hire- Bike prices vary by time and type, but you can get a bike for an all day ride starting as as little as ¥1,000 and an electric bike starting at ¥1,500 for six hours. Weather: While i’m sure this ride is beautiful in most conditions it’s best done on a clear sunny day like I did as you’re able to get the best view of the islands from each bridge. If it’s looking a little cloudy and you’re there in rainy season, be sure to pack a light wet weather coat and something to protect any camera gear from getting wet in the bike basket. Safety tip: ensure you keep to the right side of the bridge while you are riding, which is clearly marked by arrows along the way. While there are many tourists taking a leisurely ride there are also just as many passionate locals using the path that don’t like to be slowed down. Don’t forget to look down! 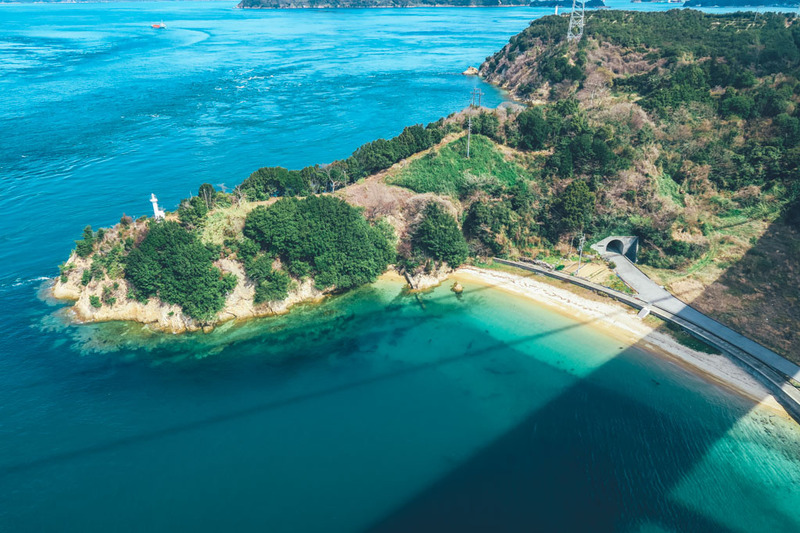 : There’s so much beauty to be found below the bridges as they cascade over the beaches and coast line of Japan. I got some of my favourite photos stopping along the way to look down and snap the scenery below. Bring a water bottle: While there are stops along the way depending on your ride time some may be closed so be sure to have H20 on you just in case. Coins and cash: While you will find some shops that take card, it’s best to have some Yen in cash on hand if you’re hoping to do some food or souvenir shopping along the way. Tolls: There are toll points along each bridge, so if you’re planning to do the whole 60km ride then be sure to ask the bike shop you hire from for a discount pass, which is available to those riding across the entire distance. I wore gym tights, sneakers and a T-shirt with a denim jacket, which was great but I did get a little cold. Depending on the season I would suggest bringing a scarf and some gloves along and be sure to layer up as the wind chill factor is something to consider, especially if you’re planning to do the whole 60Km. Remember you can always take a layer off if you get hot along the way. 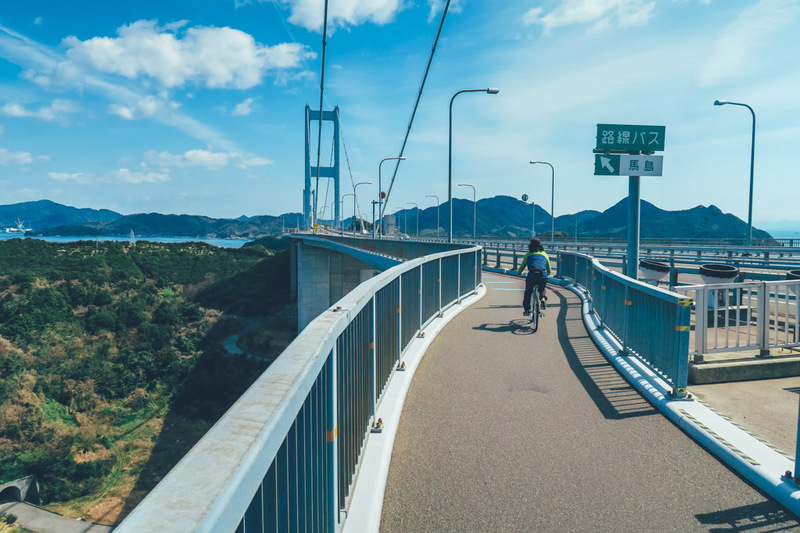 With exercise comes hunger and while I didn’t stop to eat on my Nishiseto Expressway ride, there are loads of options for you if you get hungry. 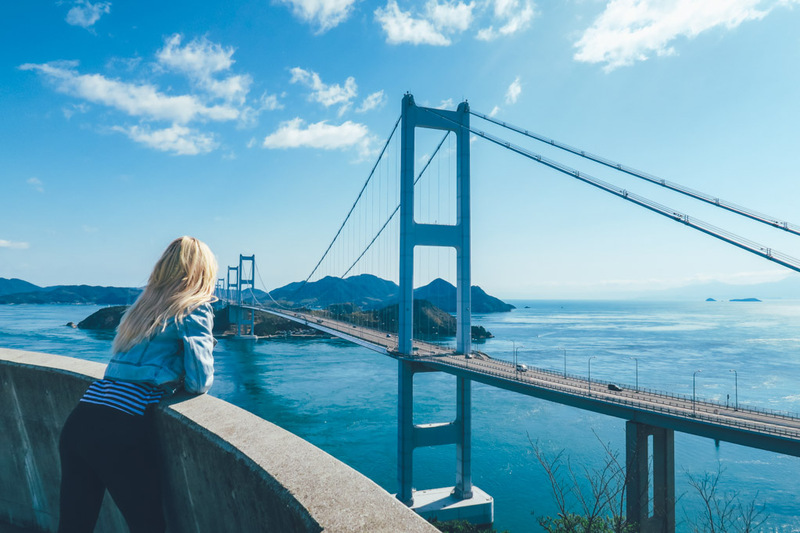 Between each set of bridges you will find coffee shops, Japanese restraurants and street food sure to fill you up. 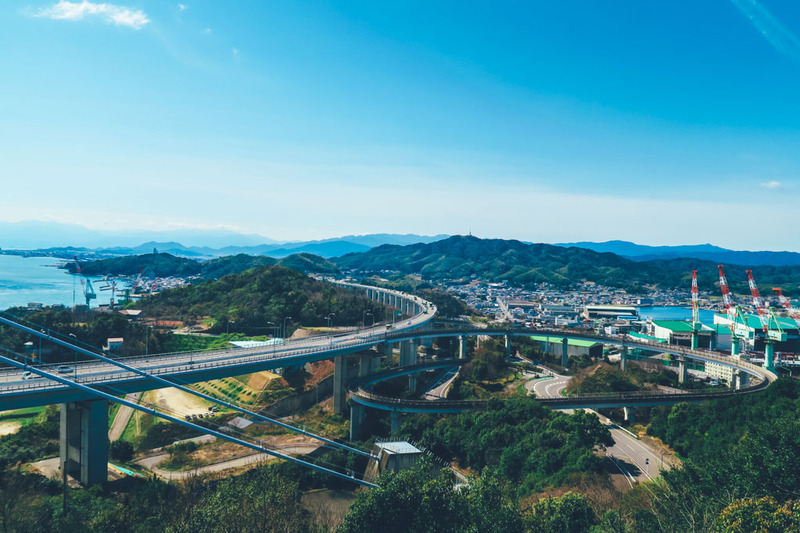 All in all the Nishiseto Expressway is an impressive ride, wether you do 1km of it or all 60 you’re sure to get some beautiful images and see a very unique perfective of Japan, i highly recommend doing it, it really is the perfect way to see the Japanese coast line. *While in Japan i have been a guest of JTNO however as always my thoughts opinions and experiences remain to be my own.